John Constable (1776~1837) was one of the major English landscape painters of the 19th century. 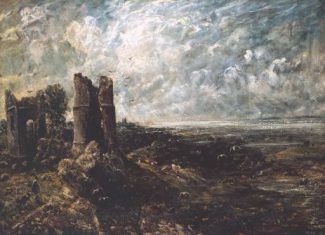 He is best known for his paintings of the English countryside and, in 1814, he visited Hadleigh Castle and made a small drawing of the ruins. In the 1820s, he used this drawing as preparation for ten oil sketches (one of which is owned by Tate Britain) and a single painting. This painting ~ ‘Hadleigh Castle, The Mouth of the Thames – Morning After a Stormy Night’ ~ is now at the Yale Center for British Art at Yale University. Constable made full-size sketches like those of Hadleigh Castle for many of his paintings, as they allowed him to explore his ideas before committing them to the final canvas. The finished picture in this case was exhibited at the Royal Academy in 1829. As an image of loneliness and decay, the painting reflects his desolate state of mind at this time, due to the death of his wife.